I've been waiting for the Assassin's Creed series to go full-pirate for a little while now. Earlier games in the series have allowed the player to climb about the riggings of ships, swash their buckles across the decks of schooners, and generally freely engage in all the kinds of things that pirates do. But the ships were always docked in a harbor, and the pirates were always on land, and so Assassin's Creed fans could only partly live the pirate dream. Until now. 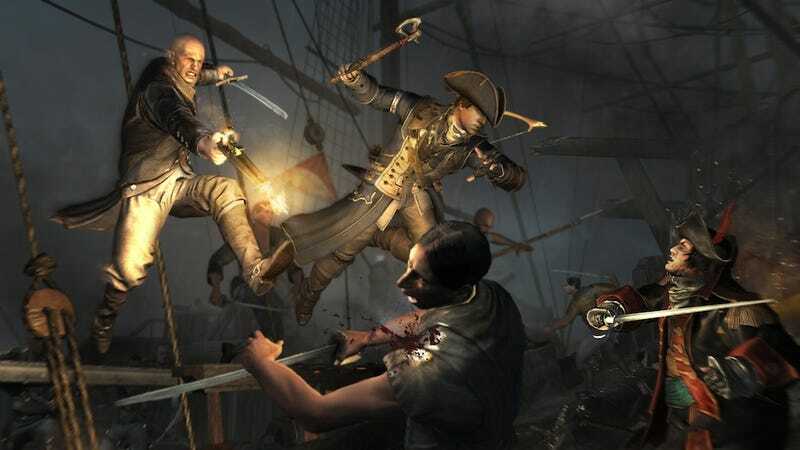 I've finally gotten to play the much ballyhooed naval battle in the upcoming Assassin's Creed III. Last week at a pre-Gamescom Ubisoft event in San Francisco, I picked up a PS3 controller and piloted my ship through stormy waters, fighting off a couple of British Man Of Wars and emerging victorious. It was about as fun (and seasick-making!) as you'd imagine. The mission in question takes place in the Carrebean during what looks like a slightly different time thatn a lot of the other footage we've seen. Connor was out of his Assassin's hood and dressed up in the outfit of a Colonial ship captain; his crew are hunting a ship called The Randolph (at least, I'm 95% sure that's what they called it.) Not exactly a terrifying name for a warship, but knowing Ubisoft, it's probably based on a real ship. After a brief cutscene establishing the setting, I was given control of the vessel. The general controls are intuitive—Connor steers the ship with the thumbstick, while the X button raises the sail and the O button lowers it. The mast is crucial for acceleration—half-mast puts you at a good clip, while full-mast gets you going awfully fast, though of course you can't corner as effectively. Shortly after I began to make my way into the shoals near shore, the Randolph came barreling across my prow, firing a fusillade of cannon fire as it passed. With that, the chase was underway. I steered my ship out into open water, pursuing the Randolph, when what do you know! Two large British man of war battleships were waiting for me. I set a course for them and readied for a fight. I drew closer and closer to them, and as I did so, the sky darkened, and a violent storm rolled in. Naval combat in Assassin's Creed III is more forgiving and arcade-y than it'd be in a more realistic simulation; it took some getting used to, but after a while I was able to figure out how to time the delay from me giving the "fire" command and my crew launching another round of cannon fire. As I engaged with the enemy ships, I found that I never quite got the hang of the combat. By pressing the Square button, you can make your crew brace for impact, thereby reducing the damage taken from an enemy attack. (I don't know how taking cover would protect your ship from cannon fire, but hey, it's video games. Go with it.) The timing on this is tricky though—I could never quite figure out when my enemy was going to fire, and therefore I always took cover a bit after I'd already been hit. Aiming was also dicy—while a fair amount of auto-targeting seemed to be going on, it was simply too much to navigate the heaving seas, keep on line to get the enemy ships in my sights, and aim. But that could well get easier in the final game—and if you are able to aim, you'll be able to do specific localized damage to each ship. If you hit its bow, you'll reveal it's "weakpoint," and hitting that will cause the ship to explode. If you hit the middle, you'll damage its guns and make it much less accurate, and if you hit the rudder, the ship will lose control. I was mostly interested in sinking the man of wars (men of war? ), so I concentrated fire wherever I could. As I steered my ship into a rock, and then into an enemy ship, and took cannonball after cannonball, I couldn't help but begin to suspect that this demo was fixed, and I couldn't die. Eventually, possibly assisted by invulnerability, I defeated the two man of wars and re-focused on taking the Randolph. Before I could board the Randolph, I had to take out its sail and incapacitate it—so, I switched to a new kind of cannonball called a "chain-shot," which you can see being used in the image above. The chain-shot can take out an enemy's mast, leaving them open to be boarded. The other cannonball types I saw were the grapeshot and heatshot, but I didn't have a chance to give those a go. After a few volleys of chainshots, the Randolph was dead in the water and ready to be boarded. Cue a cutscene in which Connor and his crew arm up and jump, shouting, over the side of their ship and onto the deck of the Randolph. And… end demo. The thing that struck me most about this demo is how utterly unlike Assassin's Creed it was. The only parts of past games that have felt remotely similar were the parts in Brotherhood where you'd fly Leonardo's advanced war weapons—but even those didn't have the grandeur and ambition of these ocean battles. I get the sense that the Assassin's Creed team is really stretching their legs with this game, and that they're pushing the power of current gaming consoles as far as possible-the ambition on display is really something to behold, and the fact that the naval battle was also functional and interesting says a lot about the level of talent at Ubisoft Montreal (and at Ubisoft Singapore, who designed the naval sections of the game). These guys are no doubt awaiting the next generation of gaming consoles with bated breath. In the meantime, they've put together a mighty fine-looking game and made Assassin's Creed just a bit more pirate-y. Man, look at that last one. So pretty. Drink up your bottle of rum.